When Your Child Dies: Tools for Mending Parents’ Broken Hearts provides grief-stricken parents with the tools, strategies and tips to navigate the grieving process and to handle the aftershock of this devastating loss, the death of a child. With compassion and empathy, When Your Child Dies reaches out to console, relate, guide, converse and offer insight to bereaved parents. The book relates the emotional, psychological and spiritual facets of grieving for a child and promotes healthy coping. It also provides practical tools to address internal and extraneous challenges, such as the intrusion of the media or the justice system. When Your Child Dies is a comprehensive step-by-step guide for parents, grief counseling organizations, resource centers and library grief collections. No matter what age children are when parents lose them, the pangs of loss often besiege parents’ ability to move forward. When Your Child Dies shows parents how to savor their past relationship by giving proven counsel on letting go of regrets, building a new life, incorporating the good memories in new ones and celebrating the joy and love that was shared with their child. Authors Avril Nagel and Randie Clark, M.A.MHC, CCC, have both experienced the traumatic loss of a child and speak with compassion and empathy directly to the reader, parent-to-parent, providing insightful psychological guidance, counsel and support. 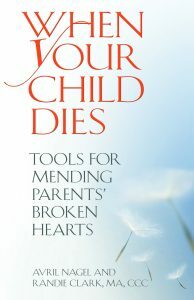 For author updates and news about the book, Like When Your Child Dies on Facebook at www.facebook.com/WhenYourChildDies.